Cellidoscope Cello Quartet is affiliated with Ptarmigan String Quartet. Both groups are professional, reliable, and eager to help make your event be the best celebration possible! Our Clients tell us "YOU ARE WONDERFUL! THE MUSIC YOU PLAY AND THE WAY YOU PLAY IT IS BEAUTIFUL. YOU ARE ALSO PERFECT ON TIMING!" Cellidoscope performs RICH, ROMANTIC music that is perfect for your Wedding or other Special Occasion! 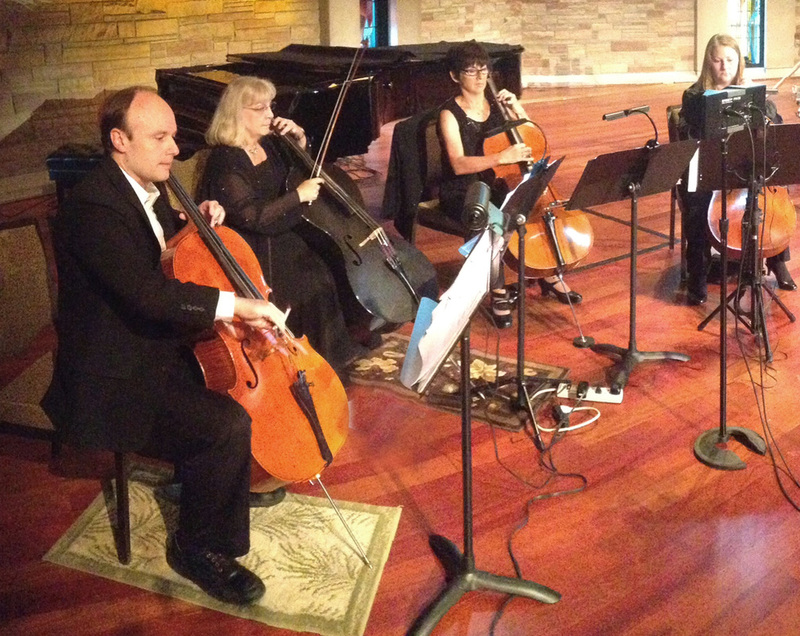 A RECENT BRIDE SAID: "How wonderful it was to have Cellidoscope Cello Quartet play for my wedding! Their beautiful music was enjoyed by all! I couldn't have asked for a more perfect group to play! One of my favorite moments of the evening was being able to take a picture with the musicians and me with my cello! How special and unique! thank you for such a wonderful presentation and for being a part of my special day! Thanks again! Love, Jessica." As a quartet of four cellists, Cellidoscope performs music for Special Events, Wedding Ceremonies, Fund Raisers, Art Shows, Parties, Corporate and Holiday events, and all other kinds of Special Occasions! Cellidoscope's musicians are professionals who are experienced and dependable. All member musicians have performed for many years with symphony orchestras and with small chamber ensembles. Cellidoscope has a LARGE, ECLECTIC COLLECTION OF MUSIC including ALL THE WEDDING FAVORITES! In its varied repertoire, the musicians perform classical favorites, pops, some rock, rags, tangos and Holiday favorites. New music is always being added to their repertoire.